It seems like it was just yesterday, when current band member Nick Santino assembled a band of musicians in the early 2008 with the help of The Maine, prior to A Rocket to the Moon’s first major festival appearance, at The Bamboozle. It has been an eventful and successful year for them – being signed to Fueled by Ramen, touring/performing with fellow friends like The Cab, The Summer Set, The Maine, Boys Like Girls, Hey Monday and so on, singles topping Billboard charts. With the heaviest of hearts, they decided that this will be their final US tour/South East Asia run of shows, and they are going to call it a day. They are beyond excited to end their final US tour the same way they started, touring together with The Maine. 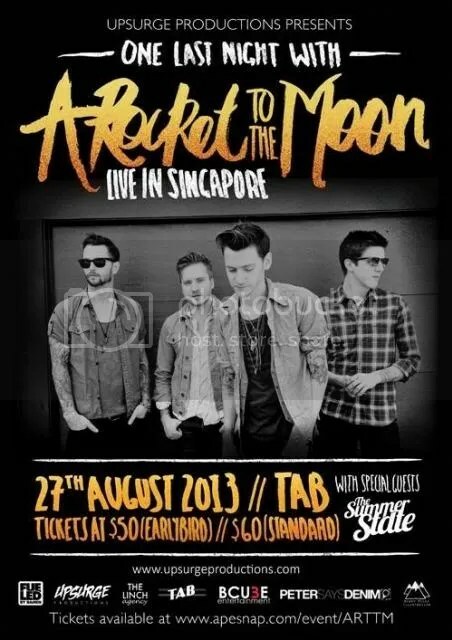 Singapore is fortunate to be one of those stops (not together with The Maine, sadly) and tickets are heard to be selling fast, so go catch them and spend One Last Night with A Rocket to the Moon! “This wasn’t the easiest decision for us, but we all felt like it was the right one and the right time. You guys, our fans, have supported us through everything. The good times and the bad. We owe you the world and words simply cannot begin to describe the amount of gratitude and love we have for each and every one of you. We ask that you come see us this summer, share some stories, laugh,sing and cry with us. For every ticket stub you’ve collected, record you purchased or T-shirt you picked up at a show, just know it has not gone unnoticed. We hope our music has been able to help you see the light in the darkest of times and has left a lasting impression in your hearts as you have done in ours. We love you with all of our hearts. For more information or to buy tickets, visit here. Signed to fearless records, just like their good friends from A Rocket to the Moon, they had Billboard chart topping singles, Billboard chart topping albums, toured with fellow good friends like We The King, Good Charlotte, Boys Like Girls, The Academy Is…, The Cab, There For Tomorrow, and so on. With growing fan base over the years, The Maine have performed tours like the Vans Warped Tour, and even had their own headlining tours. Just not too long ago, the band released their fourth album Forever Halloween on June 4, 2013. Happy was the first single, followed by Love and Drugs. The third single These Four Words, is what frontman John O’Callaghan is calling the “most revealing song [he] has ever written”. 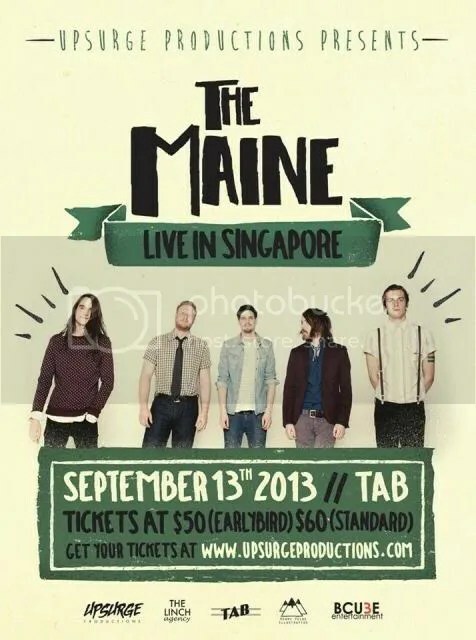 Sadly, A Rocket to the Moon and The Maine wouldn’t be touring together for this Singapore stop! However, the both of them will still be gracing our shores, both on different dates. Those catching A Rocket to the Moon, you may want to consider having a fun night going crazy with The Maine too! Big thanks to Upsurge Productions!